OFFICIAL RESCUE TEAMS from the U.S. and other countries who have searched for trapped people in collapsed structures around the world, as well as emergency managers, researchers, and school safety advocates, all agree that “Drop, Cover, and Hold On” is the appropriate action to reduce injury and death during earthquakes. Methods like standing in a doorway, running outside, and “triangle of life” method are considered dangerous and are not recommended (see below). Your past experience in earthquakes may give you a false sense of safety; you didn’t do anything, or you ran outside, yet you survived with no injuries. Or perhaps you got under your desk and others thought you overreacted. However, you likely have never experienced the kind of strong earthquake shaking that is possible in much larger earthquakes: sudden and intense back and forth motions of several feet per second will cause the floor or the ground to jerk sideways out from under you, and every unsecured object around you could topple, fall, or become airborne, potentially causing serious injury. This is why you must learn to immediately protect yourself after the first jolt… don’t wait to see if the earthquake shaking will be strong! 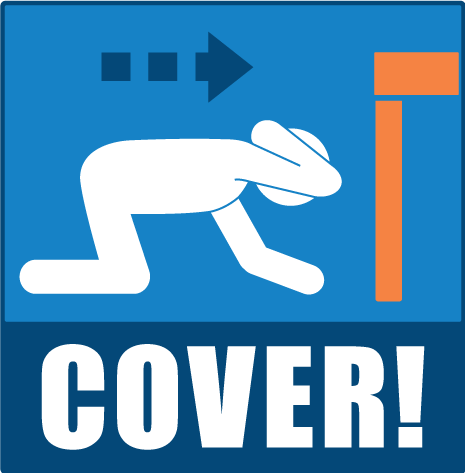 Trying to move during shaking puts you at risk: Earthquakes occur without any warning and may be so violent that you cannot run or crawl; you therefore will most likely be knocked to the ground where you happen to be. So it is best to drop before the earthquake drops you, and find nearby shelter or use your arms and hands to protect your head and neck. 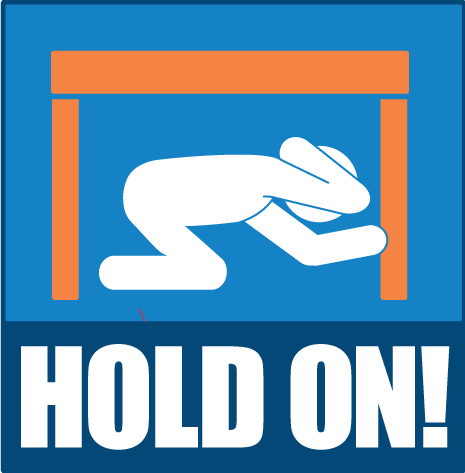 “Drop, Cover, and Hold On” gives you the best overall chance of quickly protecting yourself during an earthquake… even during quakes that cause furniture to move about rooms, and even in buildings that might ultimately collapse. The greatest danger is from falling and flying objects: Studies of injuries and deaths caused by earthquakes over the last several decades show that you are much more likely to be injured by falling or flying objects (TVs, lamps, glass, bookcases, etc.) than to die in a collapsed building. “Drop, Cover, and Hold On” (as described above) will protect you from most of these injuries. You can also reduce your chance of injury or damage to your belongings by securing them in the first place. Secure top heavy furniture to walls with flexible straps. Use earthquake putty or velcro fasteners for objects on tables, shelves, or other furniture. Install safety latches on cabinets to keep them closed. Instructions for how to “secure your space” are at scecinfo.usc.edu/ecablog/step1. The ONLY exception to the “Drop, Cover and Hold On” rule is if you are in a country with unengineered construction, and if you are on the ground floor of an unreinforced mud-brick (adobe) building, with a heavy ceiling. In that case, you should try to move quickly outside to an open space. This cannot be recommended as a substitute for building earthquake-resistant structures in the first place! Ask them to send this link to everyone they sent the “triangle” email, and to the person who sent it to them. Thank you! DO NOT get in the “triangle of life”: In recent years, an e-mail has been circulating which describes an alternative to the long-established “Drop, Cover, and Hold On” advice. The so-called “triangle of life” and some of the other actions recommended in the e-mail are potentially life threatening, and the credibility of the source of these recommendations has been broadly questioned (see links at right). You will be more likely to react quickly when shaking begins if you have actually practiced how to protect yourself on a regular basis. 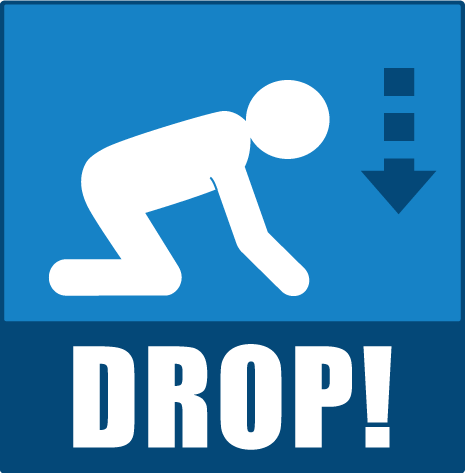 A great time to practice Drop, Cover, and Hold On is by participating in a Great ShakeOut Earthquake Drill (each October in most areas).